If you can answer yes to the following questions you'll want to get your hands on the Understanding HootSuite Crash Course Package! Did you know that HootSuite the leading social media dashboard and it can be used to manage multiple social networking profiles, as well as track conversations and measure social media campaigns? As a matter of fact, this powerful suite of tools can help you monitor your brand, raise social awareness and increase your social presence online. When it comes to using HootSuite to monitor and manage your social profiles it can be an extremely effective tool that can help you keep all of your social networking channels like Facebook, Twitter and LinkedIn organized and updated from one convenient place. But the simple fact is most people don't fully understand how powerful HootSuite can be, so they never take full advantage of everything that it has to offer! Did you know that when used properly, HootSuite can be used to establish brand, track ROI and expand social media presence? It's true! The "Understanding HootSuite" course was specifically designed to show even absolute beginners how HootSuite can be used to monitor and manage multiple social networks, establish social presence, interact with consumers as well as track social media campaigns. Even if your readers have never thought about using a third party application to manage their social networking profiles before they will quickly understand how they can use HootSuite's powerful suite of tools their advantage! The best part is with the private label rights to this course not only will you be able to learn the ins and outs of using HootSuite for your own purposes, you will be able to pass that knowledge on to your subscribers. You will be providing them with quality information that will help them understand what HootSuite is and how they can take full advantage of everything it has to offer! The entire course is completely customizable. With a few clicks of your mouse you will be able to add in your own contact information lessons in the series. You will also have the freedom to include your own product and service recommendations along with links to your favorite affiliate programs. I'm even including a ready to go to squeeze page and confirmation page, so that you can get set up quickly and easily! With this series you will receive 5 preformatted email lessons that have quick and easy to understand information that you and your subscribers can start using to immediately impact your business! 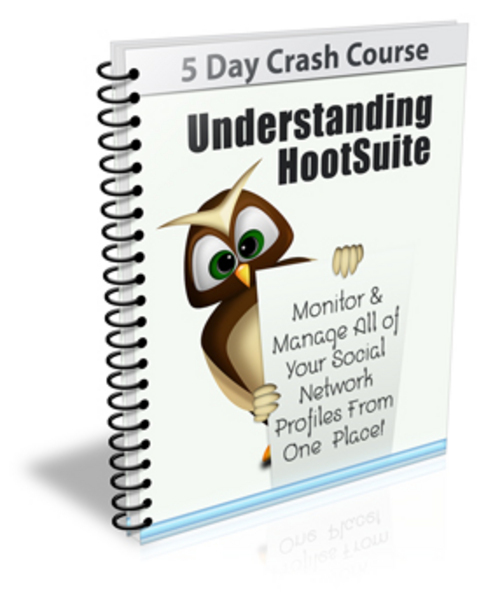 The "Understanding HootSuite" package contains everything you need to start using it right away! Remember, this package comes with private label so you can edit this entire course, sign your name as the author and use it to build your list and promote your products!